Warm peaches among sweet, smoky onions with a crispy bacon topping. Alongside watermelon, peaches share the honor of being an emblematic fruit of summer. Plus, there's the satisfying feeling of a cold, sweet peach in the midst of a humid, muggy summer. When you have something as wonderful this fruit, it's easy to leave a good thing be, but I've never been in the business of leaving well enough alone. Plus, we really had a plethora of peaches. Fortunately, I stumbled on this recipe at The Bitten Word. Peaches often have a place in salads or desserts, but hovering them between side dish and dessert seemed like the perfect new territory to cover. To me, the addition of bacon needed little, if any, justification. However, the onions seemed like the odd guest at a party. Although, thinking about it, it makes perfect sense to bring in the sweet savoriness of onions. Afterall, you've already got sweet peaches and savory bacon. Why not tie it together with sweetly savory caramelized onions? When brought together, they form a magnificent combination in a comforting and savory yet sweet dish. 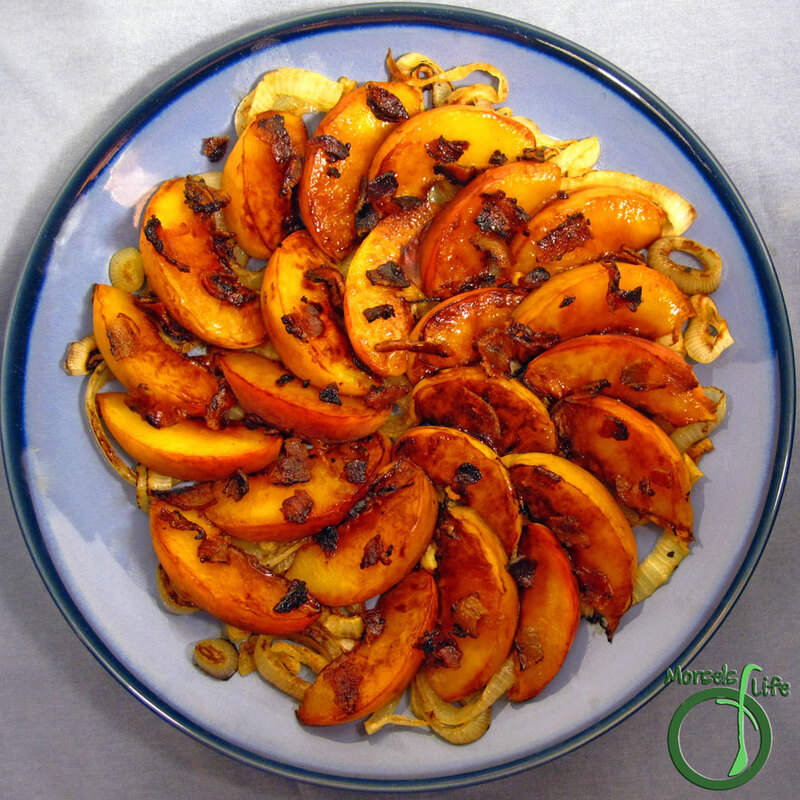 Why not finish off National Peach Month with this sweetly savory dessert? What's your favorite sweetly savory dish? 5 onions, diced I cut into rings, but I think diced would work better. Sprinkle brown sugar and chili pepper flakes over bacon, and then cook bacon until crispy. Once crispy, cool on paper towels. Cook peaches until tender, and then toss with onions and bacon. Wow! That looks really good! Thanks for sharing at Must Try Monday. Grab a featured button if you don't already have one. Can't wait to see what you will bring to the party this week!. Ohh! I definitely have to make this one for my husband - he loves peaches and bacon. I can guarantee that he's never had them before!